Mang's Bat Page: How many planets have rings? Everyone knows about Saturn's rings. They are fabulous and viewable through even small telescopes. But did you now that some of the other planets have rings as well? How many more? One? Two? More? Saturn's rings were first observed by Galileo in 1610. His telescope wasn't quite good enough and he mistook them for moons. It wasn't until 1655 when Huygens, using a much better scope, identified them. Uranus's ring system was the second discovered. In 1977 scientists using the Kuiper Airborne Observatory discovered the rings by accident when a star they were following passed behind the rings. 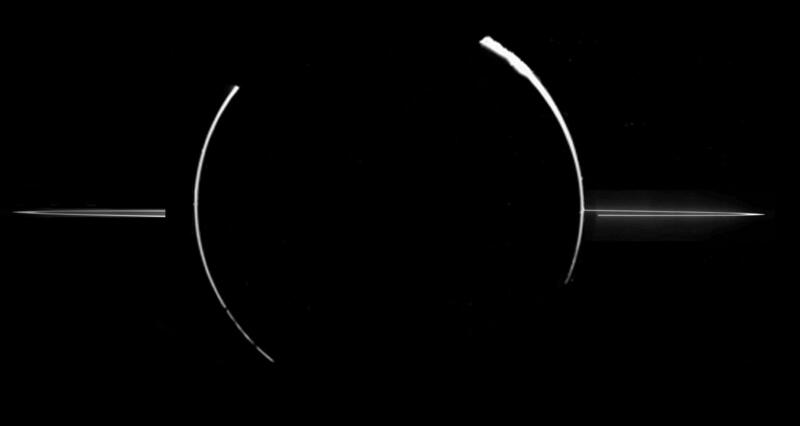 The rings were first photographed in 1986 by Voyager_2. An additional set of rings was discovered by the Hubble Space Telescope in 2005. APOD has several photos of Uranus's rings, here, here, and here. Another unusual fact about Uranus is that it's tilted dramatically so that as it goes around the sun, we will see it from pole to pole and find ourselves looking down on (and later up to) its rings. Jupiter has rings too. They were discovered by Voyager 1 in 1979. They are normally invisible. The photo above was taken by the Galileo spacecraft when Jupiter eclipsed the Sun. Neptune's rings system was discovered by Voyager 2 in 1989. Hints of rings began to emerge a few years previously. The rings of Neptune also appear to be unstable. Update: It seems that one of the moons of Saturn, called Rhea, may itself have rings! For more information see here and here. Update: There is one other object that may have rings - Pluto. See Does Pluto have rings? Posted by Mang (433rd) at 6:10 p.m.